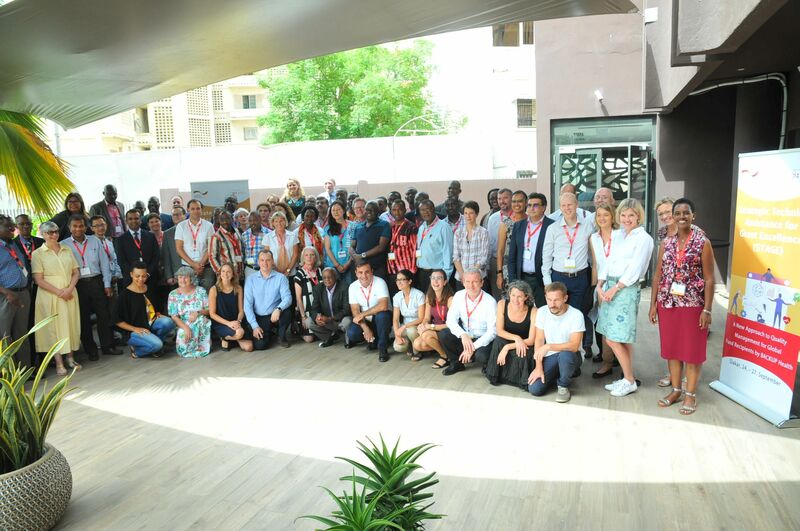 GIZ BACKUP Health officially presented a new technical assistance approach for Global Fund recipients called STAGE – Strategic Technical Assistance for Grant Excellence – during a 4 day-workshop in Dakar, Senegal. The global GIZ Program BACKUP Health was created in 2002, and is one of the existing technical assistance mechanisms that aims to support the implementation of Global Fund programs (the other existing technical assistance mechanisms being UNAIDS regional technical support facilities, WHO [Global TB Program, Roll Back Malaria], the French 5% Initiative, and direct channels available through the Global Fund [Community, Rights and Gender Technical Assistance, CCM orientation program]. Most of the technical assistance providers support applicant countries in submitting concept notes to the Global Fund, with improving the effectiveness of their CCM or dealing with specific issues in the implementation of grants. STAGE is a new technical assistance approach as it tries not only to deal with direct issues related to the grant implementation but focuses on structural and systemic challenges faced by the recipients, embracing a broader perspective. BACKUP Health decided to create this new approach after analyzing 13 countries: Burkina Faso, Ghana, Ivory Coast, Lesotho, Liberia, Malawi, Niger, Senegal, Somalia, Togo, Uganda, Zambia, and Zimbabwe. This analysis showed that challenges faced by implementers such as low absorption of available grant funds, programmatic performance below expectations, and Procurement and Supply management (PSM) losses were often related to challenges faced by the organizations in eight key management areas. These structural and systemic challenges include difficulty in ensuring dynamic planning; an insufficient availability and quality of programmatic data; inadequate procurement and supply management planning and reporting leading to stock-outs and overstocks of health products; inefficient financial management processes. Global Fund implementers will now have the opportunity to address issues related to improving planning and program revision; managing data challenges, improving distribution and accountability for commodities to the last mile; and strengthening financial management. These are the first four modules of the modular STAGE approach. Five more modules will be developed and rolled out in 2019 – based on lessons learned in the current first round. The technical assistance will take the form of technical support missions (for example, between one and four technical experts contracted by GIZ specializing in areas such as finance, monitoring and evaluation, and organizational development) and remote support implemented by teams of consultants. The workshop took place on 24-27 September 2018 and brought together more than 50 consultants. Also participating were representatives from multiple partners, as well as Aidspan, the HIV/AIDS Alliance and two representatives from the Global Fund Secretariat. The first two days of the program were focused on an overall presentation of the STAGE approach (day 1: sharing of the new approach and experiences) and a detailed study of the four technical assistance modules and their units (day 2: exploring the new approach). The third day was dedicated to looking ahead at future missions with concrete presentations of issues faced by Global Fund implementers and exercises on technical assistance visits. On the last day, the BACKUP Health team clarified the complementarity between BACKUP Health’s various modes of intervention and explained in detail the administrative and logistical organization of the technical assistance in the STAGE’s framework. All the sessions were organized in a participatory way so that the BACKUP Health team could get technical feedback from participants, in order to improve some aspects of the approach. The STAGE approach was presented as one of the support modalities implemented by BACKUP Health. The current phase of BACKUP Health was launched in 2015 for five years and a financial commitment of € 28.7 million with the objective of improving Global Fund programs’ implementation regarding health sector coordination, health systems strengthening and grant management. The STAGE approach complements BACKUP Health existing modalities: the project mode is a long-term project support for state and civil society actors in the three interventions areas (CCM, Grant Management and Health System Strengthening); the grant agreements- consultancy contracts mode is built on partnerships with NGOs and consultancy firms on transnational and cross-cutting topics; the consultancy mode is based on mid-term targeted support through one or several external consultants. As it was underlined during the last day of the workshop, the STAGE approach is part of the last category, the consultancy-mode and does not replace it, but is adding a new perspective with a focus on structural and systemic challenges. The STAGE approach is a different way to support implementers as it focuses on organizational development, quality management and program performance; concentrates on the practicalities for grant implementers in getting the job done (“low-hanging fruits”); is based on a modular structure with each module containing several units responding to specific challenges which GF grant implementers may have experienced; focuses on the use and sustainable integration of techniques and tools into daily management tasks; and places the applicant at the center of the process as it decides what it needs and the way of working. The STAGE application process, explained on the last day of the workshop, includes several steps. Global Fund implementers in all BACKUP focus countries (see text box below) are eligible to apply. First, applicants pick and combine particular units within each module to specifically address and resolve management challenges in their organization. The technical assistance options include four modules so far (i-e. “improving planning and program revision”; “managing data challenges; “improving distribution and accountability for commodities to the last mile”; “strengthening financial management”). Five more modules will be released at a later stage. After having communicated with the BACKUP Health team and once BACKUP Health has approved the request, the technical assistance starts with a scoping visit during which the selected units are reviewed together with the applicant, and final adjustments are made to the TA assignment plan. After the scoping visit, the BACKUP team finalizes the TORs and selects a team of consultants. Then, several support visits are organized, as well as remote support. Finally, a follow-up phase, also including visits and remote support, ensures the sustainability and institutionalization of the technical support. At the end of the four-day workshop, participants expressed their lively enthusiasm for this new technical assistance approach and their appetite for implementing it. Even if the “STAGE approach is still a toddler” as said one of the facilitators, this workshop had been, without doubt, a new stage in STAGE’s development.